Vsetín is a city in eastern Moravia in the Zlin region of the Czech Republic. Originally a small town it grew rapidly with the industrialisation after the Second World War. To accommodate the growing numbers of inhabitants, large housing estates and other infrastructure were built after 1960. By 1990 the number of inhabitants in the town doubled, and at the moment there are some 31,000 people living in Vsetín. The ageing housing estates and other public buildings with their poor energy performance, together with the inefficient energy supply infrastructure constituted a source of environmental pollution and a growing burden to both the municipal and family budgets. The situation was also worsened by another characteristic feature, typical for many similar cities in the former Eastern bloc – a lack of public engagement and participation in municipal matters. Aim The council decided to radically deal with this conundrum of environmental, economic and social problems by putting forward an ambitious and inspiring vision for transforming Vsetín into a healthy, thriving and environmentally friendly city. The key notion of the vision is the quality of life, which is linked directly to the quality of the environment. This far-reaching programme is set within the framework of Local Agenda 21, based on the principles of sustainable development, good governance, system approach, knowledge and use of local conditions and resources, partnership and communication with the public. To show its commitment to these general principles the council has joined a number of related national and international initiatives. In 2001 it became a member of the National Network of Healthy Cities and officially signed up to the Local Agenda 21 programme. In 2003 the municipality signed the Aalborg Charter, committing itself further to the principles of urban sustainable development. In 2005 Vsetín became the leader of the C2ENET project (Central European Environmental Net), based on the exchange of practical experience between municipalities in Austria, Hungary, Romania and the Czech Republic on dealing with environmental issues such as energy efficiency. C2ENET conference with international participation in Vsetin. As a part of the project Vsetín became one of the pilot towns implementing the set of European Common Indicators (ECI) of Sustainable Development, focused on monitoring environmental sustainability at the local level. The satisfaction indicator, one of the ECIs, is also used to assess the level to which the council manages to link the quality of life to the quality of the environment. The satisfaction is linked to energy use by incorporating issues such as affordability of living (aimed at reduced energy costs) and air pollution (striving for reduced emission levels). The energy aspect of sustainability is further emphasized by another of the five main ECI indicators called "Local contribution to global climate change". A methodology for this indicator has been developed and will be applied next year. 3. Local Agenda 21 and its measurement criteria. _ For its own operation the council has also adopted ISO and EMS management systems, together with a number of management tools from the business sphere, such as benchmarking or balanced scorecards method (BSC). These methods are consistently throughout other energy-related council documents and strategies, such as "Renewable energy sources and efficient municipal management". The main purpose of these various methods is to build sustainability objectives firmly into planning, to connect related issues and to harmonise strategies into a unified and comprehensive system and provide transparent assessment tools for measuring the administration’s achievements. The innovative use of these tools provides an important structure to the adopted ambitious policies and strengthens the dynamic sense of progress and continuous improvement towards targets. Playground in the Jasenka district of Vsetín, which constructed during the renovation of this part. The council’s committed efforts, creative approach and delivered results support the town’s image as a centre of environmental innovation, reflected in a significantly high number of successful applications for external funding. Vsetín sets an excellent example to other municipalities, especially in the former Eastern block on how to modernise the public administration, create partnerships with the public and focus the united effort on sustainable development in general and energy issues in particular. Funding Thanks to various declared commitments and practical measures the council has been continuously reinforcing the ’green’ image of Vsetín as a sustainable town, open to modern methods and technologies and creatively linking the energy issues to the issue of the quality of life. This imaginative attitude plays an important role in the council’s high success rate in attracting funding from various sources for its energy related projects. The Maštaliska Business Incubator is an excellent example of how the council manages to integrate energy aspect into development proposals, successfully supported from the structural funds. The EU funding enabled a number of other related projects, including the C2ENET or the solar hot water heating for the council offices. To improve the municipal energy management the council also seeks available state funds, e.g. such as the grant from the Ministry of the Environment to cover 90% of the PV installation costs in the "Sun for schools" programme. The council however, tries to use its internal budget sources as well. It set up its own municipal loan system called Residential Development Fund (Fond rozvoje bydleni), providing low-interest loans for housing improvements, including thermal insulation of building fabric and renewable energy heating installations. It is also important to note that the Vsetín area is outstanding in the number of successful sustainability projects, often related to renewable energy, which can be partly attributed to the Vsetín’s inspiring example. The range of practical measures, both in the field of energy efficiency and renewable energy, is a testimony of the Vsetín council’s creativity and their commitment to the sustainability principles. _ At the beginning of 1990’s the majority of domestic heating in Zlin used to be supplied by a number of local coal-burning boiler plants, characterised by their inefficiency, lack of regulation and insulation and high levels of resulting emissions. The council supported the newly created heat supply company Zasobovani teplem Vsetín in its large-scale programme of rationalisation and modernisation of the heating system. By 1997 all coal-burning plants were closed down and most households were connected to a single district heating system supplied by one modern gas-powered central heating plant. These comprehensive measures resulted in almost 40% saving in the consumed heat (300 000 GJ/year), significant reductions in emission levels and a resulting improvement in air quality and public satisfaction. These measures have been accompanied by a corresponding programme of energy modernisation, focused on municipal housing stock and other council-owned buildings. The council also runs the Municipal Energy Advice Centre advising citizens on energy efficiency and renewable energy issues. _ All these measures reduce the energy intensity, emission levels and energy expenditures and consequently improve the air quality, the affordability of living and citizens’ satisfaction. The improved energy management thus contributes to the higher quality of life. City councellors of Vsetin in Güssing visiting a plant for producing biodiesel. _ The Vsetín council shows the same responsible and inspiring leadership in the use of renewable energy technologies. It has commissioned a set of detailed analyses of the individual technologies’ potential and adopted a range of practical measures to implement them. Most of the council’s efforts focus on schools as places with the highest potential of inspiring a positive behaviour change in the society. The Ecological School programme with its environmental audits encourages all schools to carry out responsible management of resources, including energy. In connection to this, all schools in Vsetín have taken part in the state programme "Sun for schools" and installed PV panels on their buildings. Despite its limited contribution in real energy terms, this attractive and visible technology is actively incorporated into the curriculum, having a positive effect on the energy awareness of the pupils, who then spread it to the wider public via their families. The council also actively promotes the use of solar hot water heating. As a part of the Interreg IIIA project, solar hot water panels have been installed in 8 nursery and primary schools, saving about 120MWh/year. In another project the council installed seven evacuated panels on the building of the local cinema to provide hot water for the council offices, saving approx. 177 GJ/year of energy and 36 000 Czech Crowns (approximately 1.400 Euro). The council-run environmental education centre is used as a demonstration site for a range of modern renewable technologies. Apart from PV panels the building uses a heat pump as the main source of heat. This technology is also to provide heating in a complex of a new business centre as a part of the "Mastaliska Business Incubator" project. The expected energy saving for heating and hot water is about 300 MWh/year. The council actively co-operates with its foreign partners seeking the best practice in energy management and the use of renewables. It used the example of the Austrian municipality of Gussing and created a position of "manager of the renewable energy centre". His task is to carry out energy projects and to search for ways of energy conservation. Furthermore he has to look for financial sources in order to finance these projects. By installing these technologies on municipal buildings the Vsetín council sets a good example and initiates a positive change in the perception and habits of the wide public. Partnership and public involvement The driving force behind the council’s efforts is the belief that the main purpose of public administration is to improve the quality of life of its citizens while respecting the principles of sustainable development. One of the main ECI indicators is the "satisfaction of citizens", measured in dependence on a number social, economic and environmental aspects. From the social point of view the satisfaction depends mainly on the satisfaction with the work of the council itself and the possibility of public involvement. The council sees its own responsibility in providing the ’good governance’ – a responsive and responsible, accountable and transparent modern public administration, assessed by such criteria as quality, efficiency, cost and citizen satisfaction. The ’good governance’ also commits the council to provide a leadership and to set a good example on sustainability issues such as energy use. The council operations, including buildings, are to become inspiring examples of practical sustainability, initiating thus wider positive changes in public attitudes. The increased public involvement is seen as a key element of ’good governance’. The Vsetín council tries to involve the public into planning and decision-making at all stages. It makes use of the principles of community planning and public consultations, where a wide range of stakeholders, including the public can voice their opinion, identify issues and suggest possible measures. This principle has been successfully used e.g. in the case of housing estate regeneration plans, in which energy efficiency was identified as one of the key issues and adequate measures were suggested. The council also uses a variety of other feedback channels such as public surveys, satisfaction questionnaires etc. Such a notion of a council’s role radically reverts the traditional perception of public administration in the former communist countries, used to arrogant, unimaginative, directive, exclusive, top-down decision-making and a limited level of public involvement, resulting in public frustration and disengagement. By its efforts for openness and communication the Vsetín council succeeds in increasing the feeling of mutual trust and cooperation and creating a strong community partnership as the best and most reliable basis for community action and a guarantee of citizens’ satisfaction. The focus of the Vsetín council on the issues of sustainable urban development provides a clear unifying perspective for the municipal development strategy. Energy management is not seen as an isolated technical issue, but rather as an inseparable part of wider sustainability, in which energy and the environment are directly linked to the quality of life and satisfaction of citizens. The key notion of ’good governance’ promoted by the council is based on an efficient public administration, providing leadership on sustainability issues and working and communicating with the public in an equal and open partnership aimed at achieving common goals, including the sensible use of energy. The sustainable development objectives are incorporated into a comprehensive dynamic system of integrated and mutually supportive municipal strategies, the implementation of which is facilitated and assessed by a variety of complementary methods. This provides a powerful vehicle for delivering the numerous practical measures in the fields of energy efficiency and renewable energy. 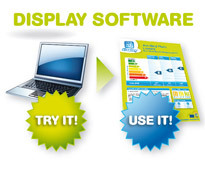 the dynamic sense of improvement and achievement.In this sense the Display® Campaign could provide an ideal tool for delivering the council’s objectives.